Large Attendance Of Members Of Family Enjoy Event At Delightful Woodland Spot In This City. Mrs. W. P. Bryan, Russell Pauline, and Paralee Bryan of Plano, Dee Cave, Mr. and Mrs. J. P. Cave and Glenda Cave, Mr. and Mrs. Ted Cave, Daisy Dee and Louise Lee Cave, Mrs. John Cave, Annabelle and Charles Cave, Mrs. Ray Betty, Charles and Glen Betty, all of Weston. J. T. Cave, Mrs. Lewis Cave, D. C. Phyllis, Patricia, Drucilla, and Betty Cave, Mr. and Mrs. Clyde Crouch, Mr. and Mrs. William Moore, Billy Jesse, and Wanda Brazeal, Mrs. A. L. Cave, George, Mildred, Helen and Herman Cave, all of Melissa. Mr. and Mrs. J. M. Cave, Roberta, C. H. Betty, Margie, Jimmy and Jerry Cave of Oklahoma City, Harold Cave of Denton, Carl Cave, Mr. and Mrs. J. C. Gaulden of Dallas; Mr. and Mrs. Gilliam Hobson of Richardson, Mr. and Mrs. Charles Tasnbow and Betty Jo of Wylie; Mr. and Mrs. Clinton Wilson, Jane and Linda of Sherman, Mr. and Mrs. Abb Cave and grandsons, Benny and Doyle, Mr. and Mrs. Elzie Brawell, Elzie Brawell, Elzies Ray Harbery and Shirley Ann, Mr. and Mrs. Earl Britton all of McKinney; Mr. and Mrs. W. T. Cave, Mr. and Mrs. Tom Cave, Paul, C. B. and Imogene, Mr. and Mrs. Royse Cave, Joan and Carolyn, Billy Cave, Mr. and Mrs. J. R. Gantt, Genevieve, Bobby and Jimmy, all of Princeton, Mr. and Mrs. Cliff Cave and David of Grant, Michigan. Friends attending were Mr. and Mrs. Alex Hobdy, Mrs. W. Gaulde, Mary Ruth and Betty of McKinney, Miss Mary Ida Wilson of Weston, John and Lou Darland Selvin Swanner of Melissa, Glenn Woodard of Fort Sill, Oklahoma, Mrs. W. G. Darland and Dorothy of Sherman. George Washington Cave, son of John Talbot Cave, was born in Missouri. On December 5, 1866, in Springfield he was married to Eliza Frances Fulton and the couple lived there until they decided to come to Texas to live in 1876. They settled north of McKinney where they reared five boys and two girls.... 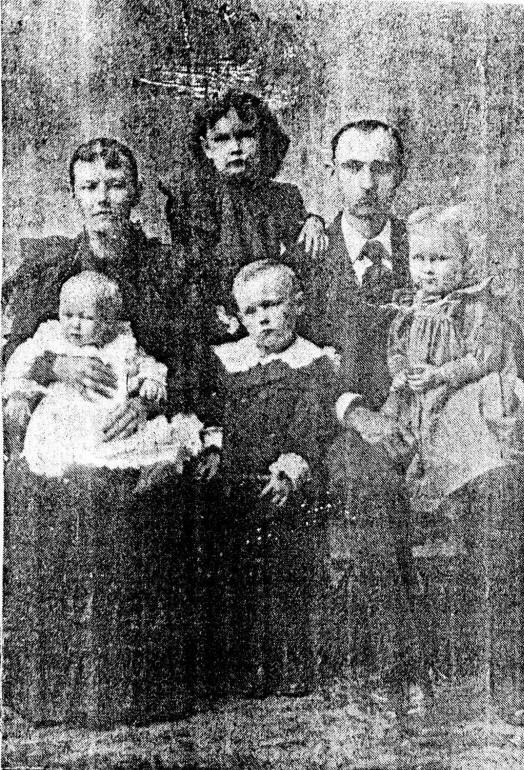 They were the parents of six boys and three girls: James Talbot, William Thomas, John (called Tanner), Everett, and Abb. One son died in infancy. The girls were Iva and Nellie. The girls never married. One girl died in infancy. Bertha Cave Wilson, eldest of the 13 children, ... married Walker Wilson August 15, 1909....They had 5 girls, one died in infancy. Walker Wilson died Feb 6, 1920. One died in 1920 and Ila Fay passed away May 24, 1936. The other 2 were Mrs. Orbrey Rhea Braswell of Dallas and Mrs. Zelma Pinckney. John T. Cave never married. Everett Cave married Effie McBee and have 7 living children.